Hi guys! Happy Snow Day!!! I wanted to check in and get back on track with the blog! I have finally hired more help!!! It feels so relieving and feels like I can now get back to focusing on what I am good at, and pushing out a few posts that I’ve been sitting on for a while! I’ll do a mini update later on, but for now I am here with five, budget friendly design fixes that I think will really help you if you are looking to refresh your space without spending a ton of $$. Last night on Instagram I asked if there were specifics you guys wanted to see hit the blog this year, and SO many of them were design and decor related. I thought this would be the perfect post to start and hold you over for a little while, while we prepare some more, in depth tips and tricks! If you try any of these, make sure to post them and use the hashtag #allieandjustinhome -I wanna see!!! Hi guys!! So many of you are looking to buy the boots that I’ve been wearing all fall and the first weeks of winter! I bought them last season and cannot for the life of me find them online anywhere. I found some really similar ones that I LOVE, I especially love this Zara option, and it might be in my shopping cart right now ……. Lol. I love the style, and for being “fashion” boots they are pretty durable. The thick heel definitely helps. I am so excited to finally share our experience buying our house! As you guys know from following along on Instagram we had a very exciting and nerve-wracking experience. We worked with REALTOR® Charlotte Pierce and bless her heart, she was SO accommodating to our needs, wants, and extreme time pressure. Honestly, the experience was so fun, Justin and I were excited to go “hang out” with Charlotte for a couple hours every night looking at potential houses. If you guys follow me anywhere on social media you have definitely seen me talking about or seen the Lululemon art installation that I was working on!! 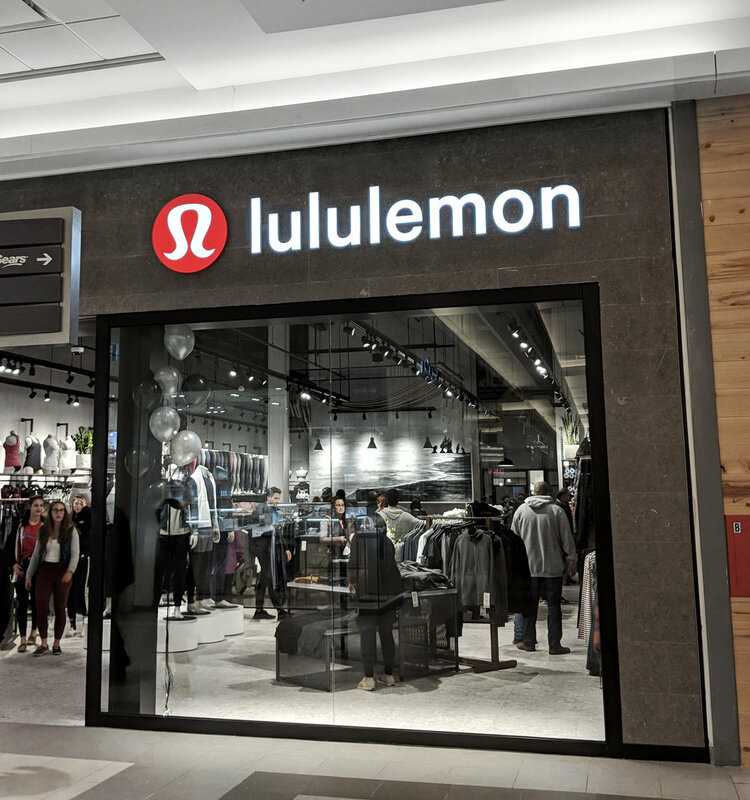 Lululemon just opened their newest store location in Moncton inside the Champlain Mall this weekend! They asked me to create an art installation as their centrepiece of the store. (!!!!!) The design team at Lulu designed the entire store with New Brunswick’s Hopewell Rocks as their main inspiration. From the floor tiles, to the finishes, the wall texture, everything. I absolutely love the idea behind it and was so happy to be able to share my contribution. Happy Sunday guys!! I finally have a home project to share with you!! It’s been really tough trying to create complete posts for these home renos because we are working on a hundred things at once and not finishing any completely LOL. But!! We have just finished the staircase! A few weekends ago I had the pleasure of photographing Emily & Sam’s special day. Located just outside of Fredericton on the cutest property ever, it was the perfect atmosphere for an outdoor fall wedding <3. Sam and Emily had been together for so long and they were so excited to finally tie the knot. The horses were out, the sunflowers were in full bloom and the skies were so so blue! Congrats Emily & Sam, and thank you for choosing me to be a part of your day. 1. It’s been 1 week and 3 days since we’ve moved in. 2. I love love LOVED living Uptown and honestly if we would have found our house Uptown we would have stayed! But -I did not know how much I would LOVE living a little bit outside of the city. It feels sooooo refreshing and calm. 3. We wanted the exterior railing up as soon as possible and Justin got it done in record time. We were afraid the dog would fall off the edge and really unsure why there was no railing there to begin with.